you were warned: do not read if you are not prepared for some pathetically ridiculous blabbing. because, that's what this is. Here's the thing. I love a good awards show. And I really, really, really looooove country music. Thus, the CMA's are like Christmas around my place. So I'm just soaking up tonight, putting off homework, laughing at Brad and Carrie (is there anyway i can get her legs without working out? please and thanks. ), wishing I was identical twins with Kimberly Perry, and soaking up Taylor Swift's genuine innocence. How adorable was Carrie Underwood's "Hi, Mom"? Isn't Target's dollar section killing it lately? Or was I really just that excited to be out of our tiny living space? I can't quite figure out what kind of person I am. I mean, I'm not the person that gets out the Christmas tree at Halloween, but man, as soon as November hits I get the Christmas fever. Not quite get-out-the-tree-in-October fever extreme, but I'm thiiiiiiiiis close to hitting play on my Carrie Underwood Christmas Pandora station. I wouldn't protest to the tree being up before Thanksgiving. Or would I? I just don't know. I will admit, I've been buying Abby Christmas"prizes" for months. Having a toddler during the holidays makes me giddy with excitement. I feel that not knowing where I stand on the matter is giving me a bit of an identity crisis. What kind of holiday person are you? Tell me who I am. You guys should hear/watch Lady sing Katy Perry's "Roar." It's her song. We sing it approximately 90,000 times a day. Good think it's my favorite song, too. And she dances. And she has the same dance moves every time. I'm pretty sure she practices her choreography. Will you judge me if I admit we (phew, that was a close one...) I am in the midst of watching Pretty Little Liars? I just can't help it. Also, Reign. Mi Madre started that one. I love it (francis! Ah!). And Parenthood - I feel like I belong to the Braverman's, late at night, while I try not to pull my hair out while trudging through homework. And Scandal?! (ok, now you really are judging me. all five of you that read this.) I mean, I've already lost your respect, so I'm just going to say it: I want to be a Gladiator in a Suit. Speaking of being an awful parent: today I realized I had hit an all time low as I ripped into a bag of stale Halloween chocolate in the middle of the store and fed Lady piece after piece - just to finish the rendez-vous in relative peace. Abby answered the phone (without my knowledge) when my doctor called today with some test results. So, that was awesome and embarrassing. This girl and her electronics. I really need to join a gym. But, all I can think about is the peanut butter pumpkin(s) I stashed away in the freezer. This time of year is going to kill me. So... I should stop. Now the world knows who I really am. A cheesy, drama loving, sap, who is obsessed with her kid and husband, and can't say no to food of any kind. Nice to meet you. I love reading you blog! :) your writing is so entertaining. I wish mine was half as interesting to read! Oh and we watch pretty much at least one show every night. Seriously. We are tv/movie junkies!!! 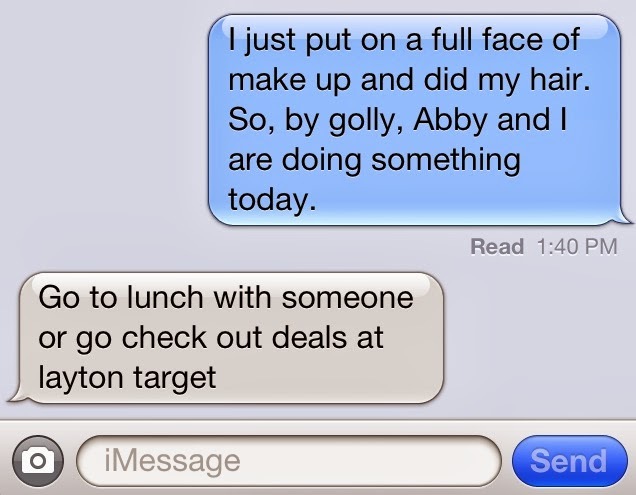 And.... if I lived even remotely close to target, I would probably go everyday. So I am jealous! ;) and- just because I wanted to make the longest comment ever- I am also the world's worst exerciser! So I am right there with you!